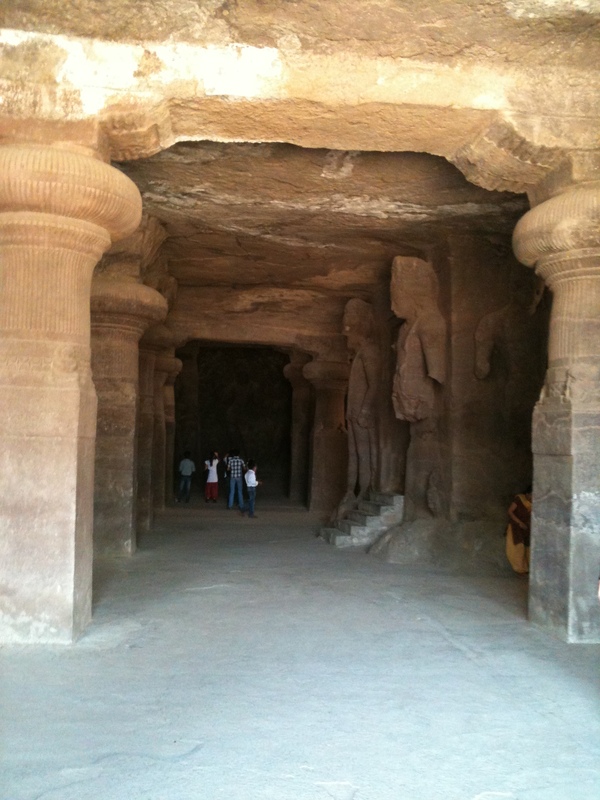 The Elephanta Caves is the most popular tourist destination of this city. 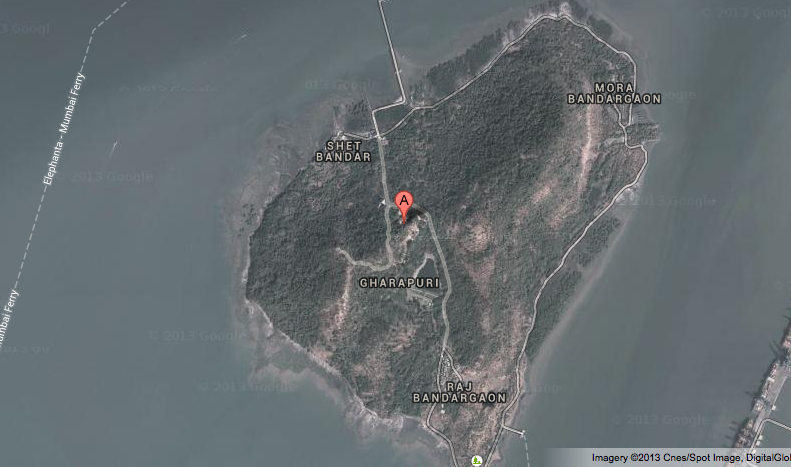 Located on the island hills of Gharapuri, it is about 11 km north-east of Apollo Bandur and 7 km from the shore of the mainland. 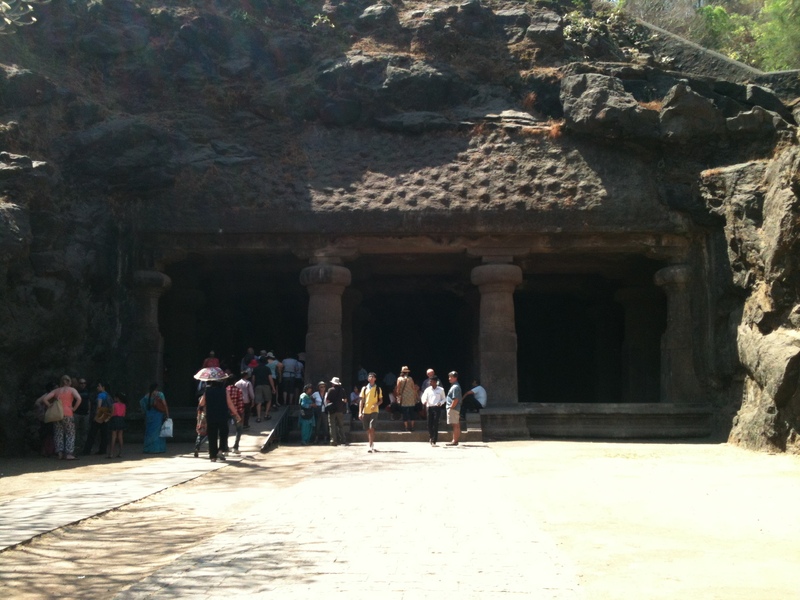 The Portuguese called this as Elephanta Island upon finding the huge monolithic Elephant sculpture, after this island came under their power in 1534. They tried to take this gigantic elephant along with them but dropped it in the sea because they did not anticipate logistical complications of hauling this huge sculpture. 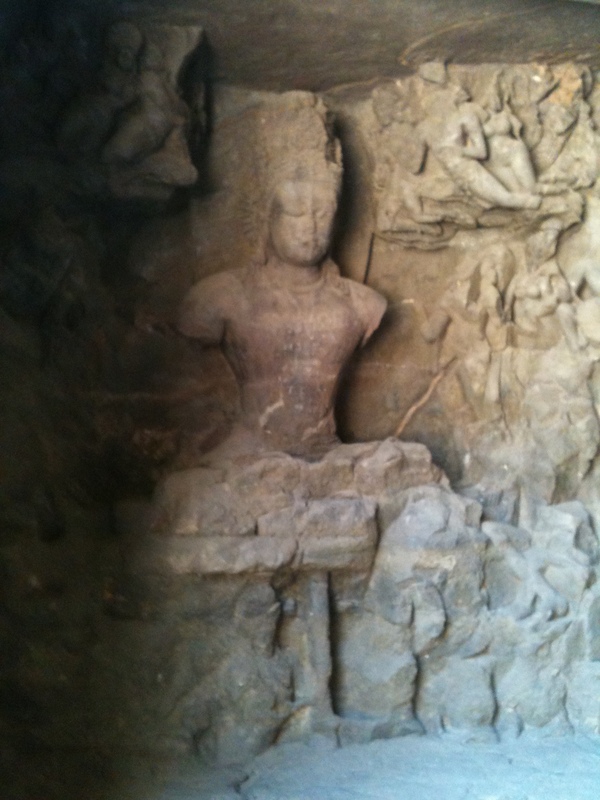 It was later the British who retrieved it and now it adorns the entrance of the Jijamata Udyan in Mumbai. 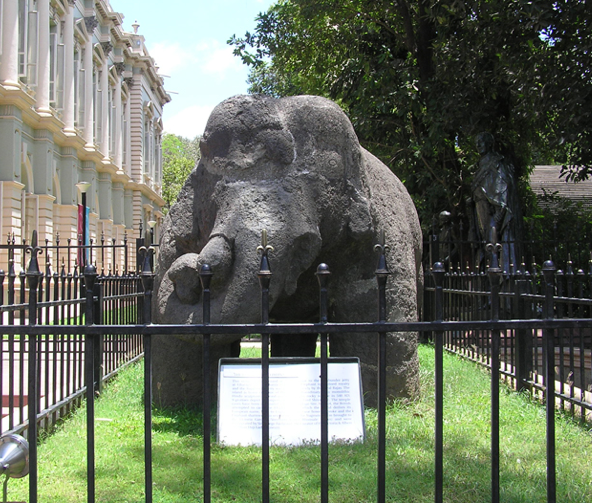 The elephant that gave an island its name sits on the island no more. Here’s a map to show the geographical location of the caves. This was a great place of Hindu worship before the Portuguese acquired power. It was called Puri or Purika during the times of Konkan Mauryas and it served as their capital. 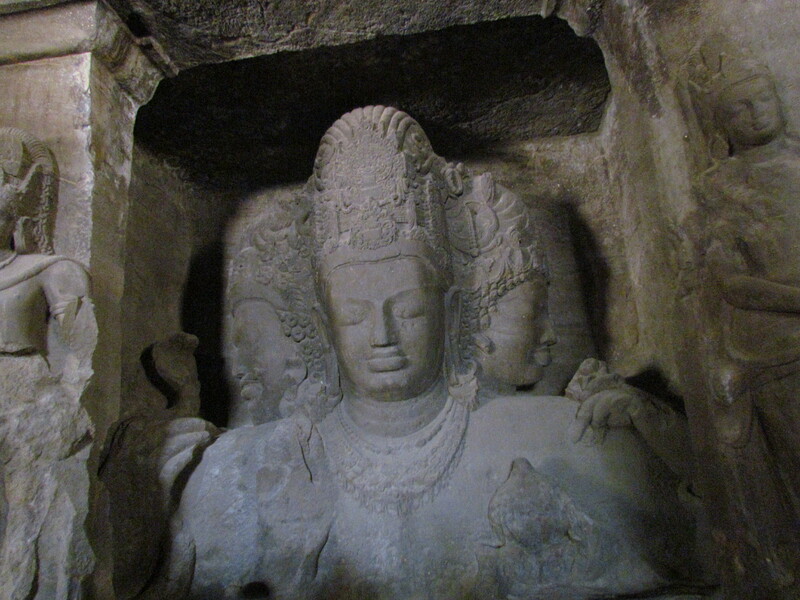 Art and archaelogical experts still think that it is debatable and speculative to judge the exact dates of construction and the builders of these caves. 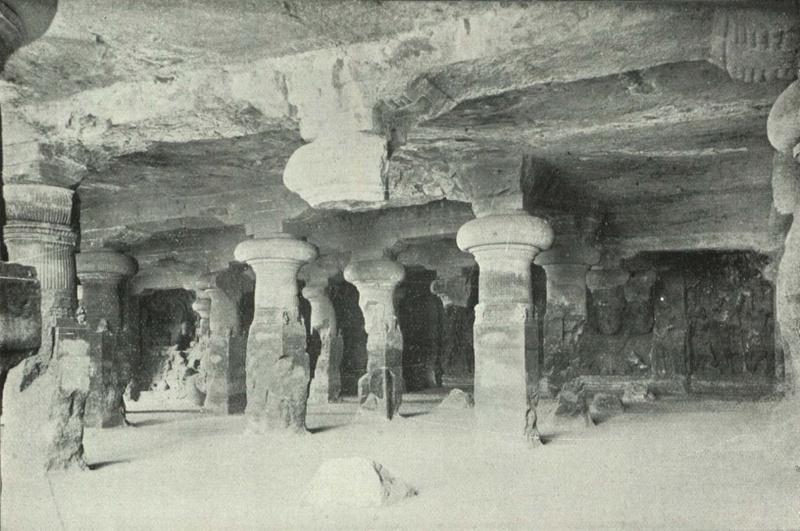 However, the intelligent estimate is that the rock cut architecture of the caves has been dated to between the 5th and 8th centuries. The caves are carved out of solid basalt rock and were known to have been painted in the past of which only rare remnants are seen now. 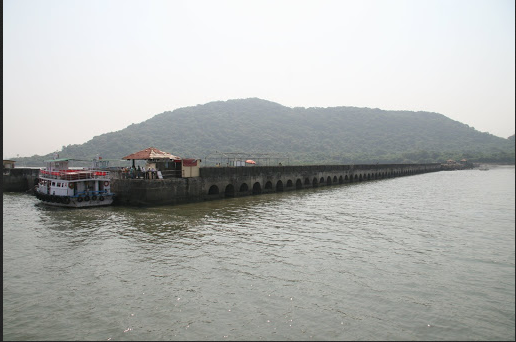 Boats to the Elephanta Island can be taken from the Gateway of India and within about an hour’s boat ride you will reach the long pier of Gharapuri jetty. From the jetty its a few minutes of a walk climbing up the stairs to the caves. There is a toy train for the fun of it that gives you a 5 min joy ride and drops you right at the entrance. You will find several vendors selling clothes and knickknacks all along the steps. Entrance to the caves. The island has two groups of caves, eastern and western. 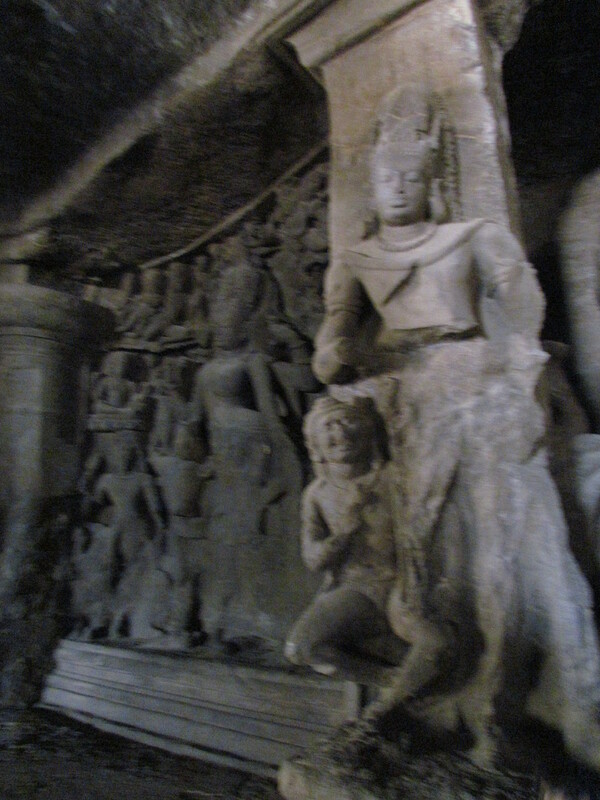 Hindu sculptures are found in the western caves which are an abode to Lord Shiva, while the Buddhist scupltures are predominant in the eastern side. 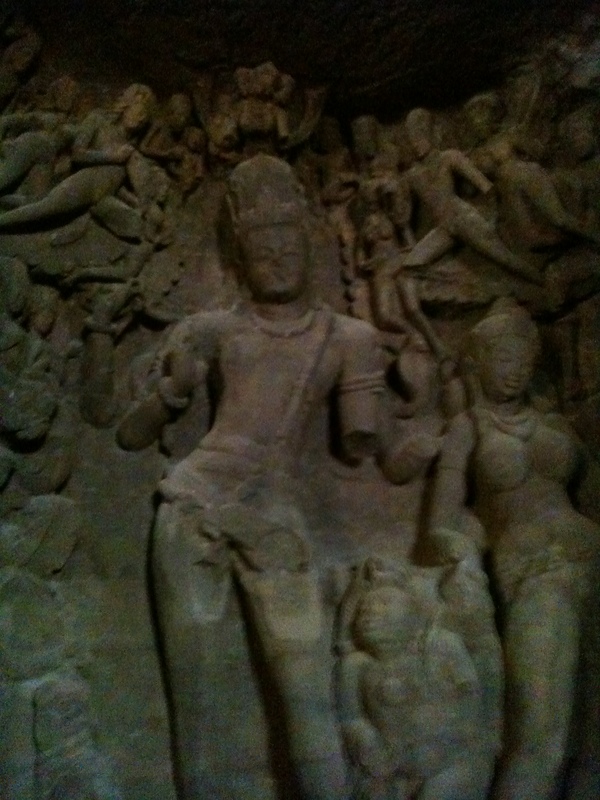 This is the famous Trimurti (of lords Shiva, Vishnu and Mahesh) sculpture which depicts the supreme power of the creator, destroyer and preserver. You can also find its rendition in the symbol of MTDC. What surprised me the most is how gigantic it was. Its about 20 ft high and looks absolutely amzaing! 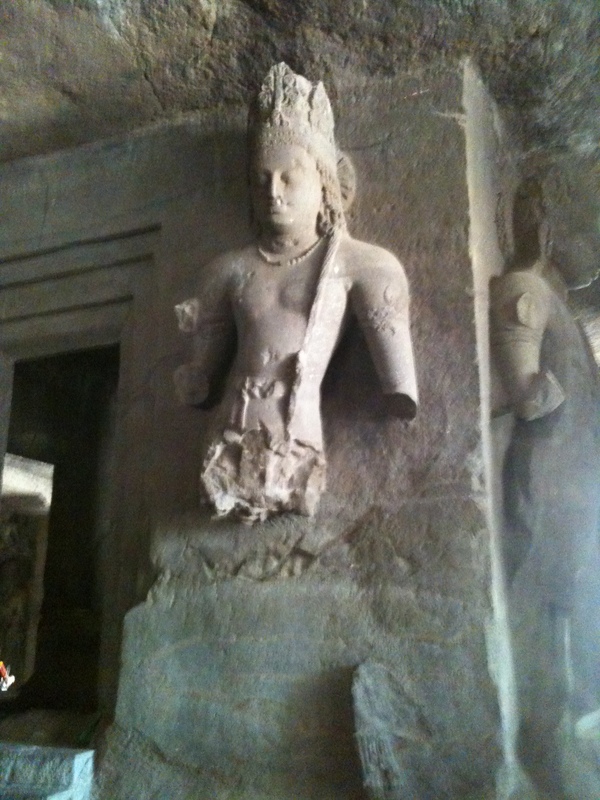 My daughter was wondering where the limbs of this idol went. I am always ready with some story, but this time I was dumbfounded. 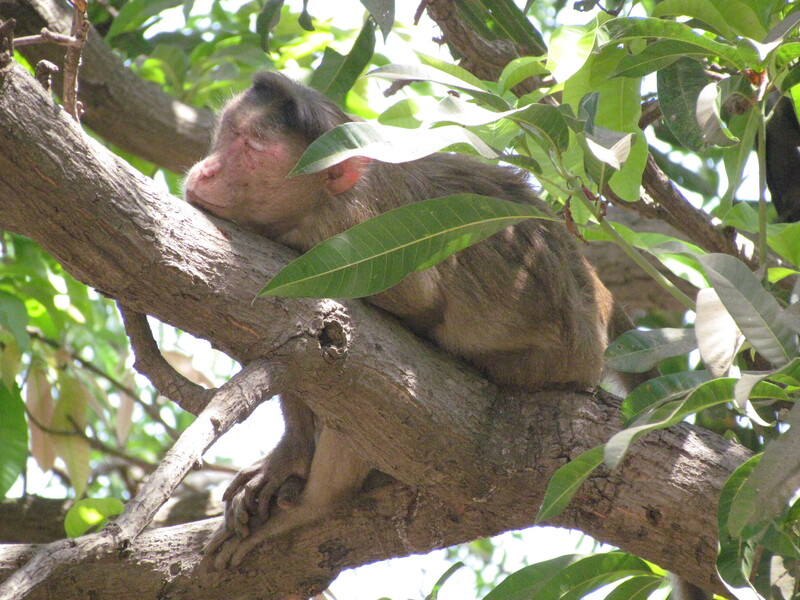 Kindly observe precaution at the entrance of the caves as these wonderful animals are roaming around everywhere. 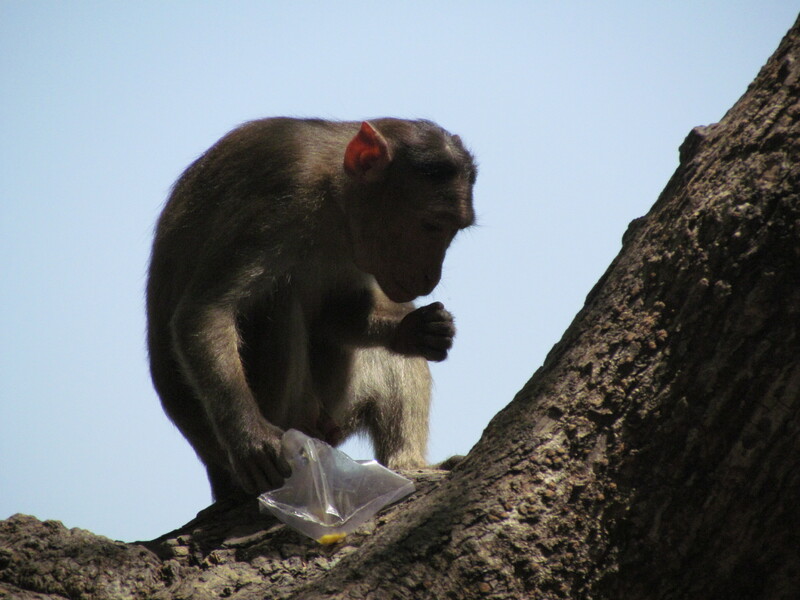 They have mutated intelligently and can figure out which of your bags have food in them. The place looks fascinating. I look forward to going there. Yes it is a must visit. Be careful to check the timings…these coming months might be a good time to go. The place looks fascinating. I look forward to visiting it.